It seems that every holiday season most Americans gain from 1 to 2 pounds of weight. It’s easier to not put on weight to begin with, as the body tends to resist losing weight, a holdover from times when an abundance of food was a rarity. As a result of overeating at holiday parties, losing weight ends up New Year’s resolution for many of us. When looking for advice on how to maintain or lose weight, I consult the Health and Medical Information LibGuide databases available to all patrons of the Alameda County Library System. I find MedlinePlus, WebMD and Mayo Clinic particularly useful for sound advice on maintaining and losing weight during the holiday season. I use the search terms holiday eating to find good articles on weight control and also how to serve ones guests healthy food during this season – and all year round. Many of these articles deal with how to cut down on sugar, salt and alcohol in the food and drink you offer your guests. Check them out to get started on a Happy and Healthy New Year! Based on the 2011 novel by Andy Weir, Ridley Scott’s The Martian tells the story of a man who surmounted incredible odds in the name of survival. When the crew of the Hermes is forced to abort their mission on Mars in the wake of a massive sandstorm, botanist Mark Watney is mistaken for dead and abandoned. 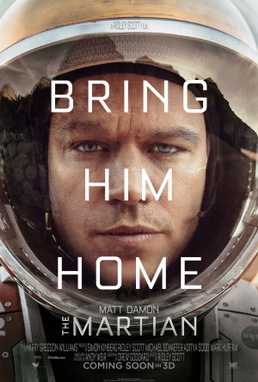 Watney discovers himself stranded on an unfamiliar planet with no method of establishing contact with NASA or his team. Vulnerable to the harsh climate and left with only a meager amount of food and supplies, Watney must rely on his ingenuity to survive. He develops creative methods of growing plants on the notoriously infertile terrain and contacting Earth using the neglected Pathfinder probe. Meanwhile, a group of multinational engineers work day and night to bring him home. Learning English as a Second Language? Join a Reading and Conversation Club at Dublin Library! If you are an adult learning English as a second language, you’ll want to participate in a new Reading and Conversation Group that will meet on Tuesdays at Dublin Library. The group will meet from 6:00 PM to 7:45 PM, and will begin on January 19, 2016. In this Write to Read Adult Literacy Program reading club, you will read a good book, and practice your conversation skills while discussing the book in a small group. Call 510-745-1480 for more details and to sign up. A royal family gets sent away with a few household guards and servants to escape a war, but someone—a stranger or a traitor—is stealing their supplies. In a city that always snows, a girl finds a mysterious boy kept prisoner in a museum. Learn how to make crafts that celebrate all the winter holidays. Kai and Gerda are best friends, but one day Kai is beckoned away from home due to evil magic. Gerda embarks on a dangerous journey to bring him back. We’re back with a new review for Teen Book Talk. This time we have a review of a classic mystery, And Then There Were None, by Agatha Christie. Teens choose the books and movies that they review, and all opinions are those of the reviewer. This is one of the most amazing mystery novels I’ve ever read. It is a literary classic novel by Agatha Christie and the first book of hers I’ve read. In this book, there are ten different people lured to an isolated mansion on an island. The night of their arrival a mysterious recording plays, accusing each of the ten characters of murder. These ten people start dying off, one by one, strangely in accordance to a poem titled “Ten Little Soldier Boys” which is hung up as a portrait in the mansion. It isn’t long before these characters realize that the murderer is actually one of them. Christie’s style of writing and pacing is very fascinating. The way she writes about each of the characters will make you think you know who the murderer is, but you will keep second guessing yourself until the very end when everything is fully explained. These characters are not really characters that I can relate to in general, but Christie makes their actions throughout the book understandable. This novel is an amazing classic that had my attention until the very end. Not only teens, but adults who like reading mysteries would love this book. The edition of the novel I read was a very recent one so there were no racist remarks or anything of that sort in this novel. The older versions did have racist titles which could make anyone uncomfortable. In general, this novel could be considered disturbing, first of all because it has many murders in it. It is pretty obvious that the murderer has psychological problems, as the victims are killed off according to the poem almost exactly. However, this is what makes it so exciting. There are subtle hints given throughout the book as to who the murderer is, but I didn’t realize it until the end. Overall, this is definitely one of my favorite books and I would recommend it to anyone who likes reading murder mystery novels. Dublin Library currently offers three book discussion groups for adults. All the book discussion groups read and discuss a wide variety of fiction and nonfiction books and discuss the same book titles at different times. Some of the titles covered recently have been “Gardens of Stone” by Sophie Littlefield, “Behind the Beautiful Forevers” by Katherine Boo, “Mayflower” by Nathaniel Philbrick, “The Book of Madness and Cures” by Regina O’Melveny, “The Soloist” by Steve Lopez, and “Plain Truth” by Jodi Picoult. The Second Thursday Book Discussion Group meets as a rule on the second Thursday of every month from 12:30 PM to 2:00 PM in the Dublin Library Program Room. On January 14, 2016, Second Thursday Book Discussion Group will be discussing Ivan Doig’s novel “The Whistling Season.” The novel is narrated by Paul Milliron, an aging Montana state superintendent of schools, encharged with deciding the fate of the state’s remaining scattered rural schools, and who recalls the autumn of 1909, when he was 13 and attending his own one-room school in Marias Coulee. Adult book discussion groups at Dublin Library are limited to a maximum of 10 participants per group. The Second Thursday Book Discussion Group welcomes new members. If you’d like to participate, come to the Adult Information Desk and pick up a copy of the book to read and come ready to have a lively and thought-provoking discussion with group members on January 14th, 2016. The Wednesday Evening Adult Book Discussion Group, which usually meets on the first Wednesday of the month from 6:00 PM to 7:45 PM, is also open to new members. Come to the Adult Information Desk for more information if you’d like to come to this book discussion group. The Third Thursday Book Discussion Group is not looking for new members at this time. For this week’s edition of Teen Book Talk, we’re sharing a teen book, The Sky is Everywhere, by Jandy Nelson. Nelson is also the author of I’ll Give You the Sun, the 2015 Printz Award for Excellence in Young Adult Literature. The Sky is Everywhere was Nelson’s first published novel. “The Sky Is Everywhere” is a book about the shifting character of Lennie Walker- a seventeen year old band geek who’s older sister had passed away. One thing I really like about this book is how even though the story is about Lennie being torn between her two love interests, the book is also about the main character growing into a better person and standing up for herself. Throughout the story I found it interesting to see how Lennie was able to step out of the shadow of her vibrant older sister and become her own person, dealing with things and circumstances that she never had to acknowledge before. One thing that I disliked about the book was how the recurring story about Lennie’s mother (who had left her two daughters to live with their grandmother) never really went anywhere or resolved itself. I would really recommend this book because I feel it had a great balance of subtle humor and romance with a fairly interesting plot. There is no material in this book (which is for teens) that would make anyone uncomfortable or force them to stop reading.